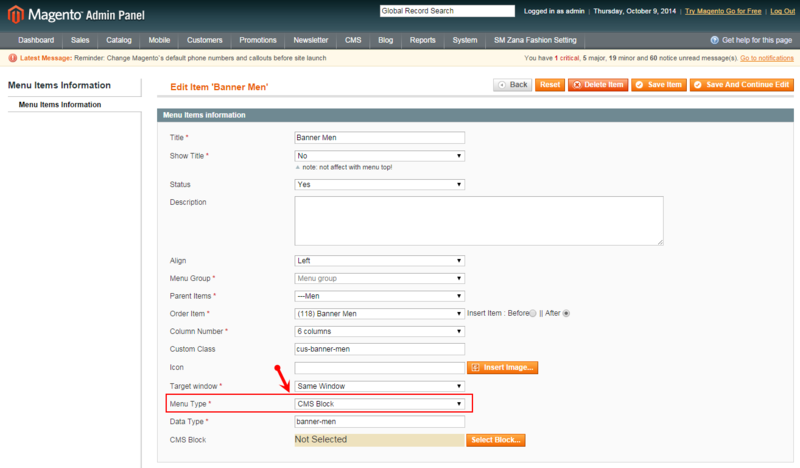 This guide will help you install SM Zana Fashion Theme step by step. 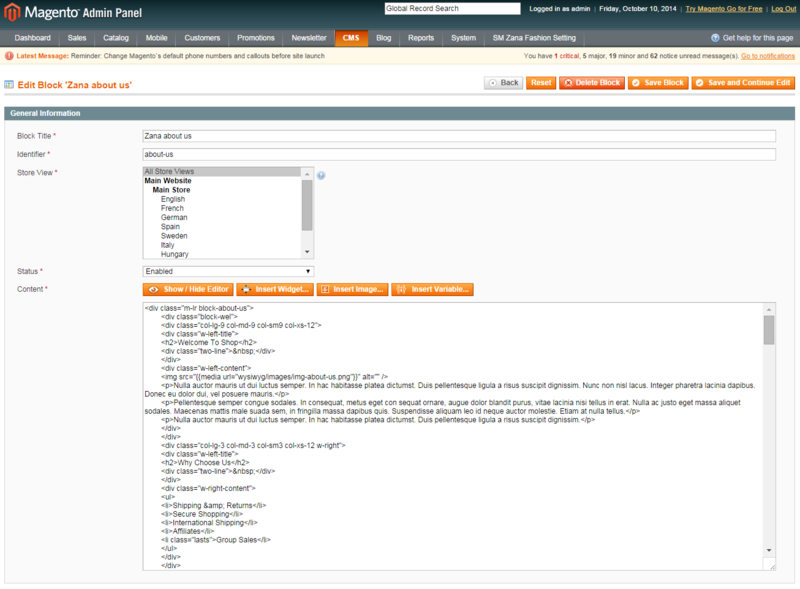 Compatible with Magento Community Edition 1.9.x (require: php 5.4 and Memory_limit no less than 256Mb). Quickstart Installation: By using this package, you will set the theme exactly as our Demo with sample data. 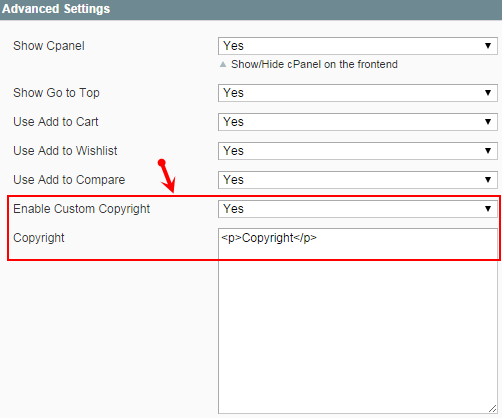 Manual Installation (include of Theme Installation and Extension Installation): You will need only be using the zipped files in “Extensions” and “Theme” folders. Step 3: Navigate to System >> Cache Management, Sellect All the cache types, take Action as Refresh and Submit. 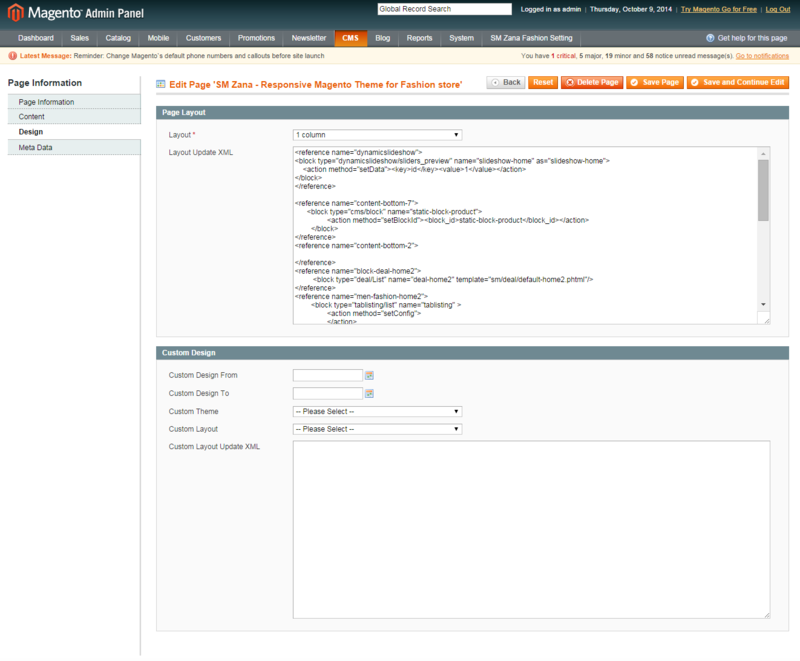 Step 4: Navigate to System >> Configuration >> Design. Step 5: In Package tab, input Default field with the actual theme name. 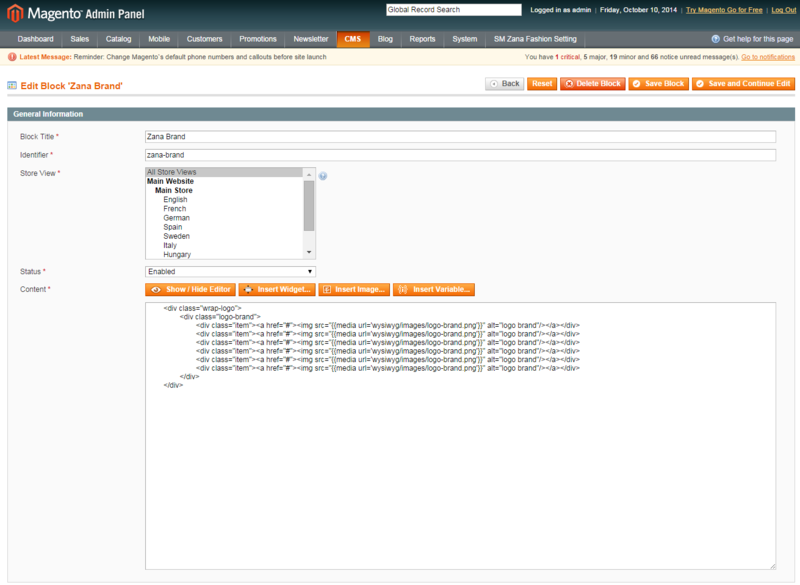 Step 7: Click Save Config button to finish.. 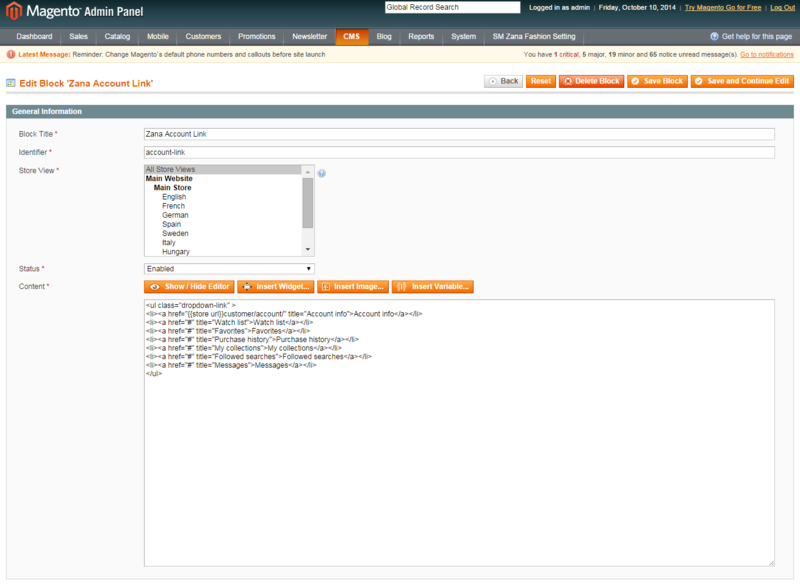 Step 1: Copy all the folders of each extension folder that you have extracted to the your site root folder. 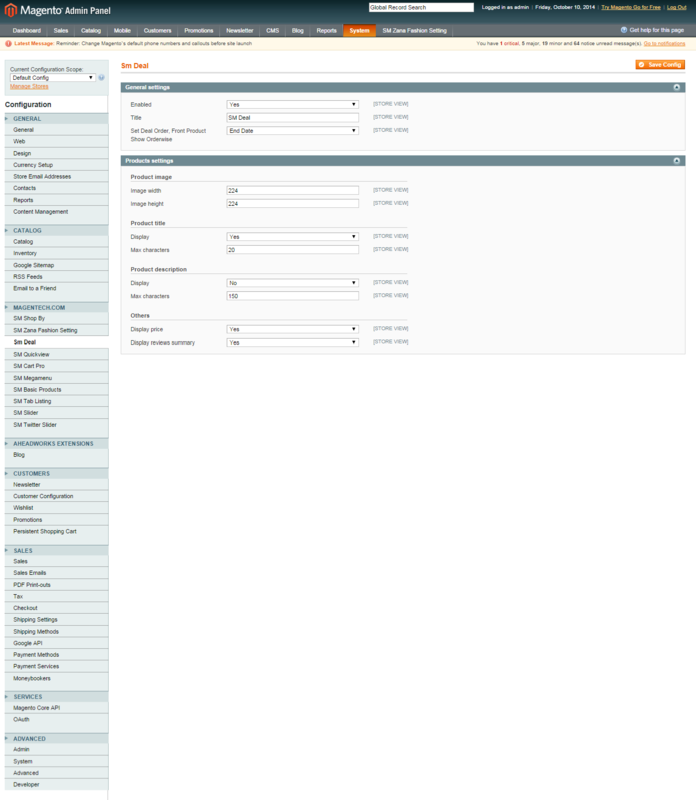 Step 2: In your Admin Panel, navigate to System >> Configuration >> Extensions Configuration (on the left-hand menu). 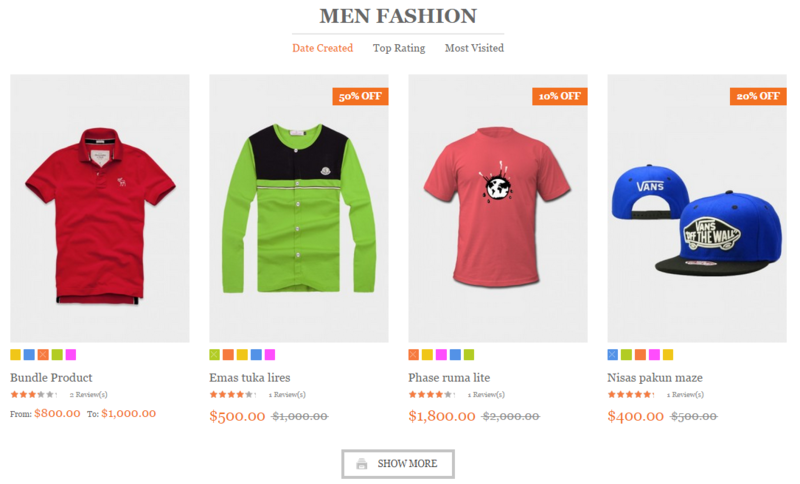 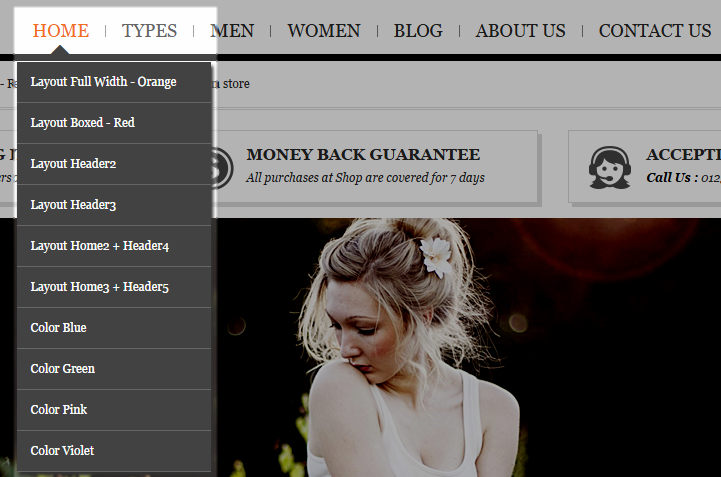 SM Zana Fashion supports Magento extension Mega Menu. 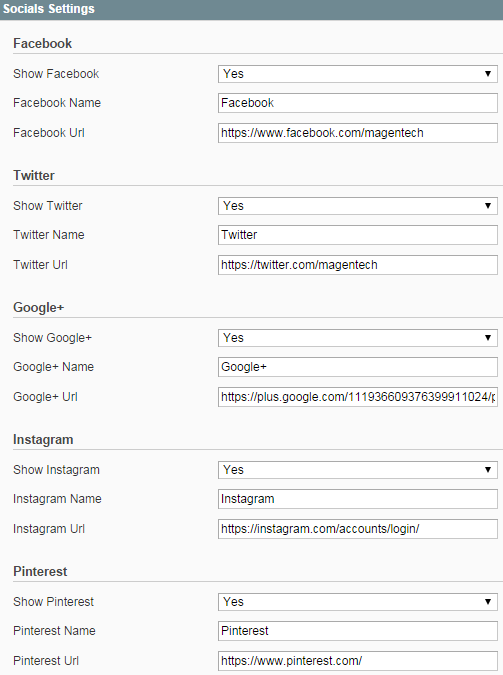 Follow the guide below to get it configured properly. 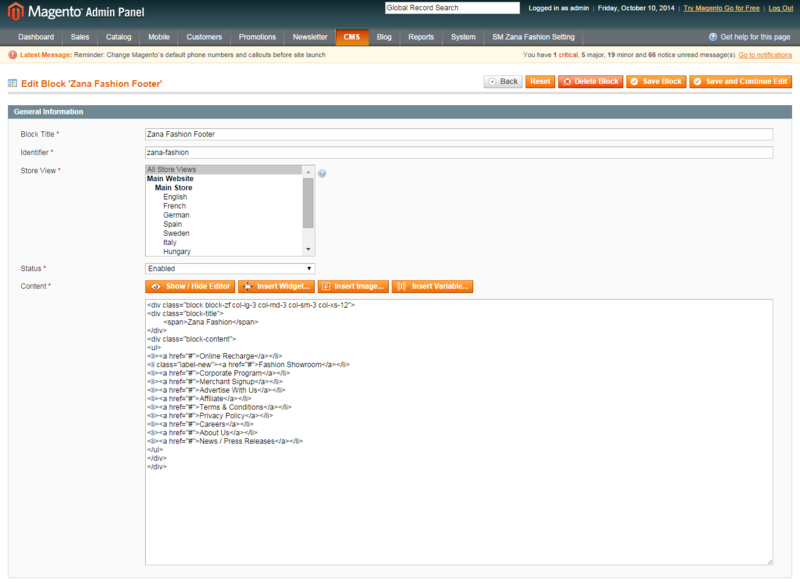 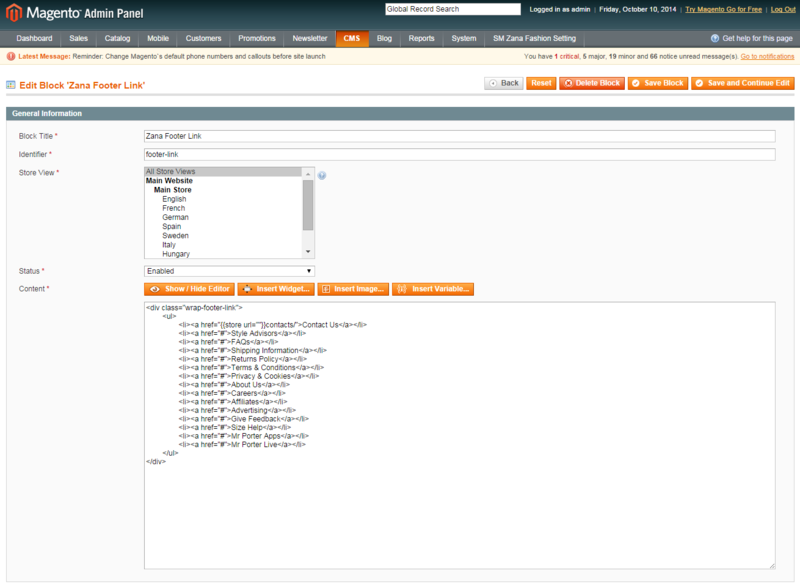 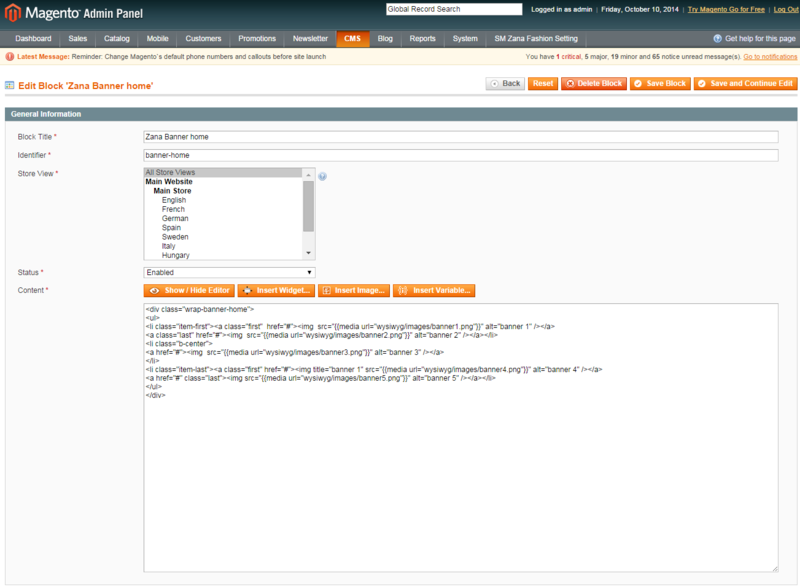 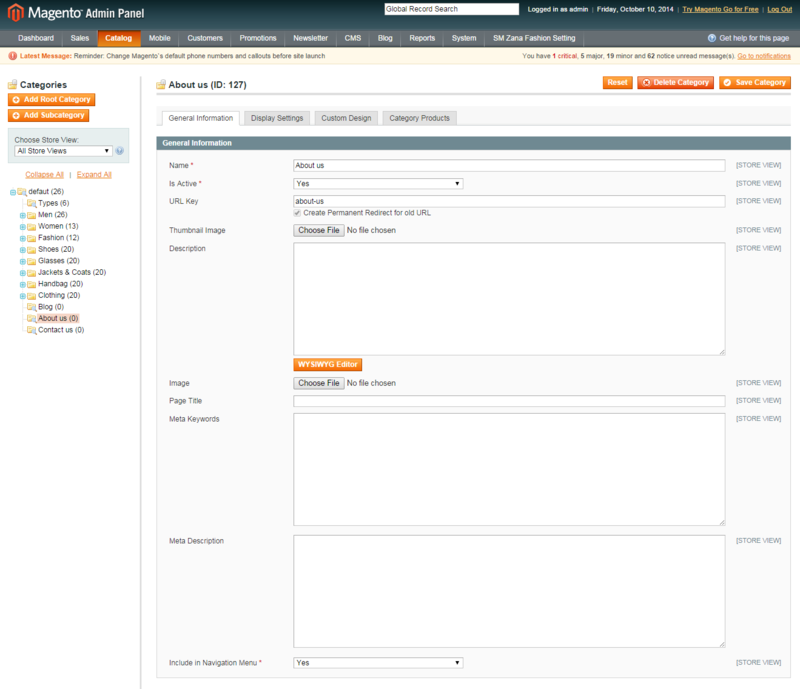 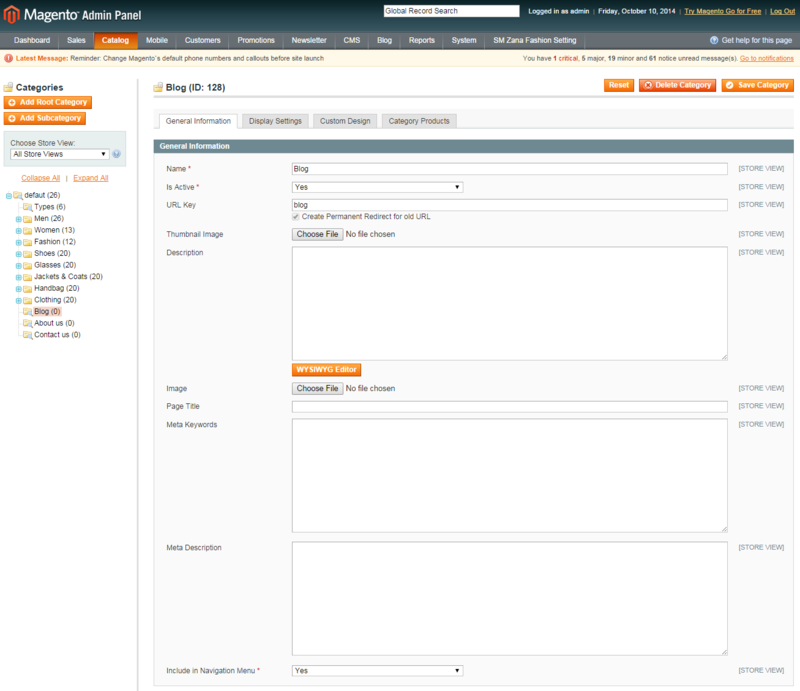 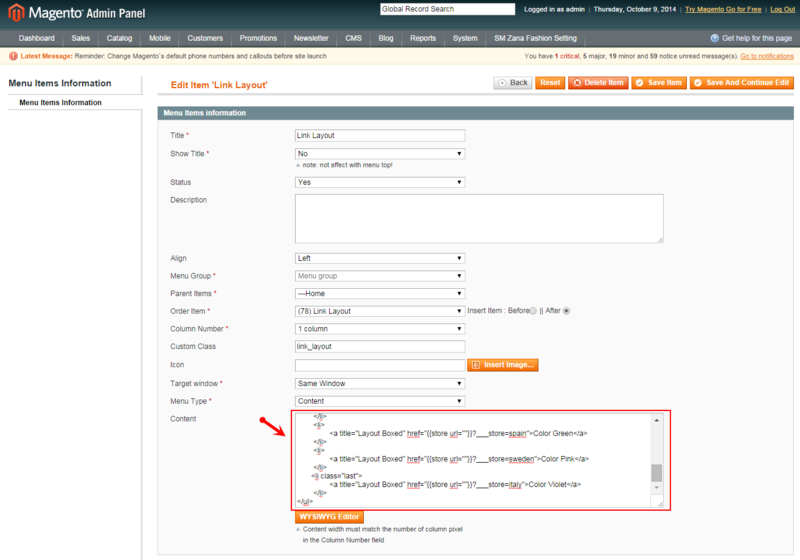 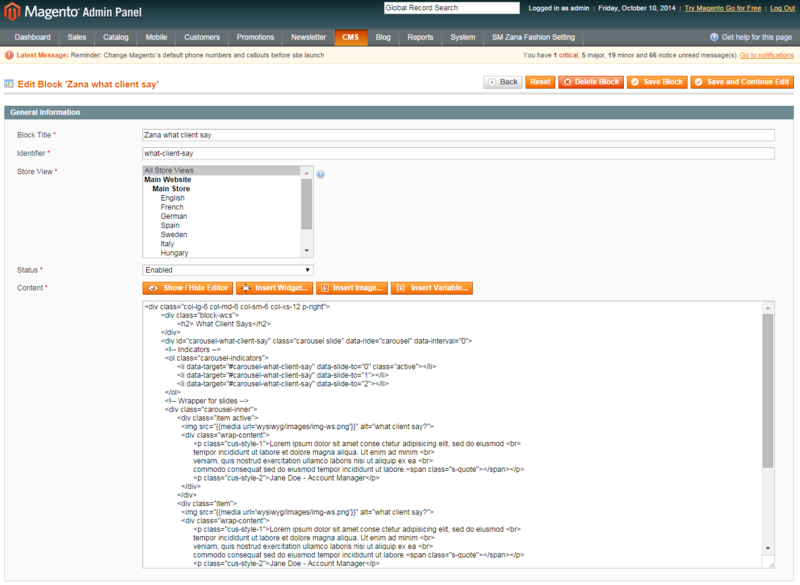 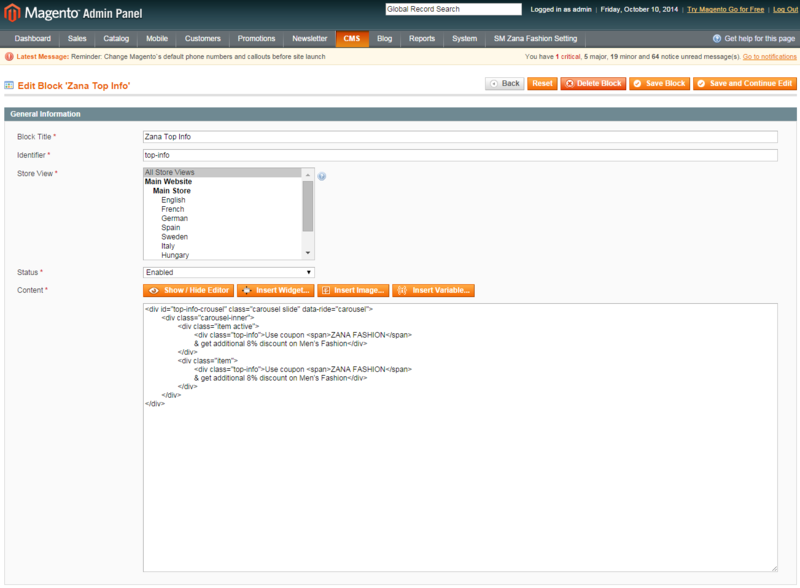 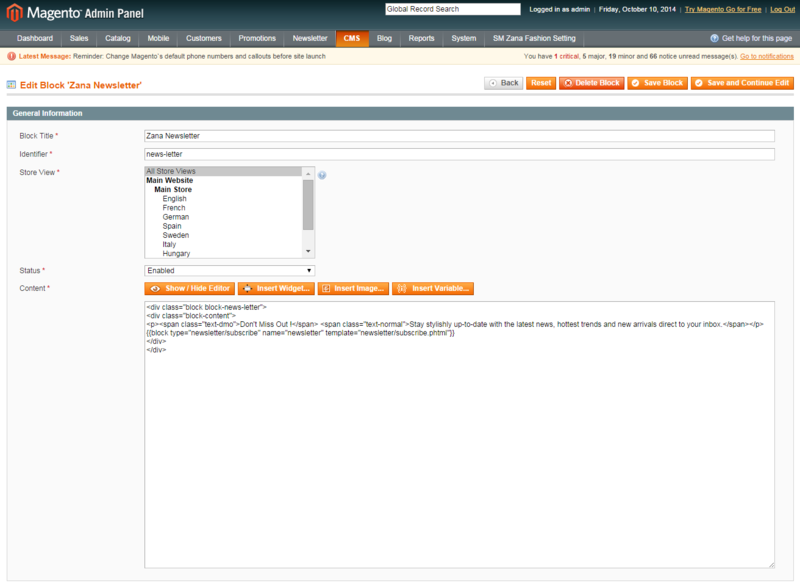 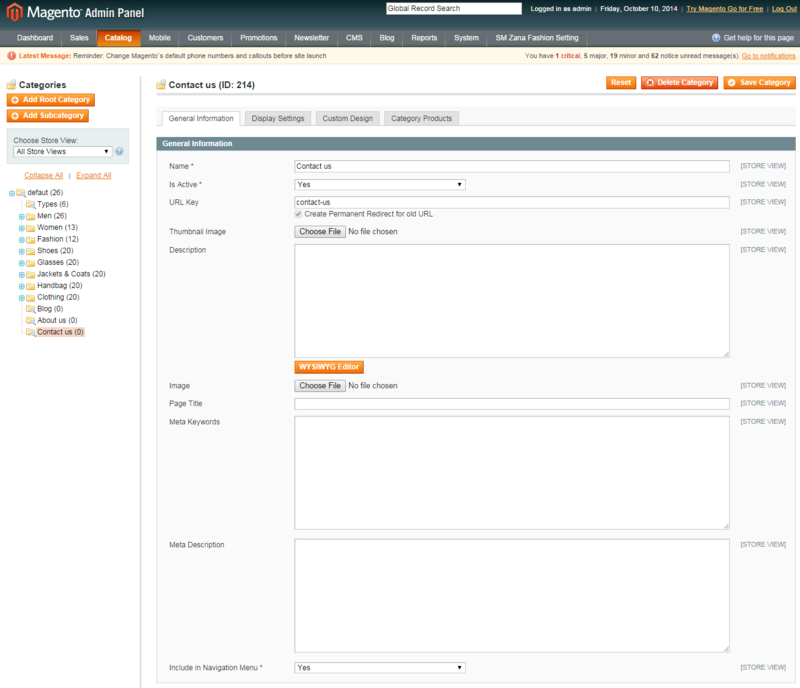 In the Magento Admin Panel, navigate to SM Mega Menu >> Menu Manager. 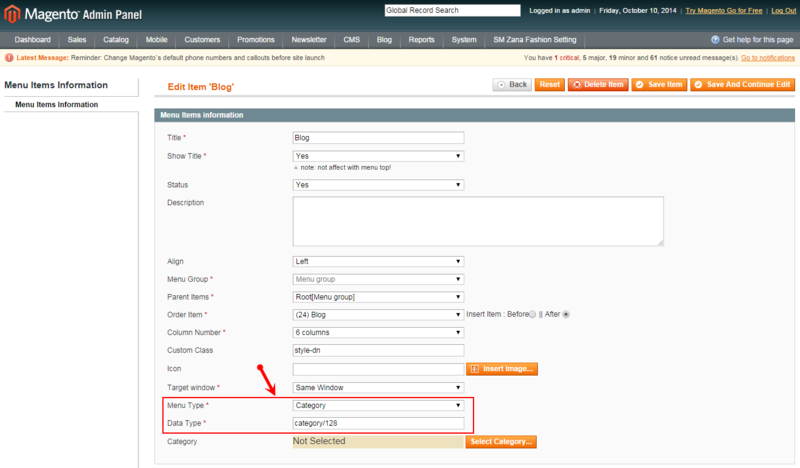 You need to create a Menu group first and then go to Menu Items Manager >> clickAi?? 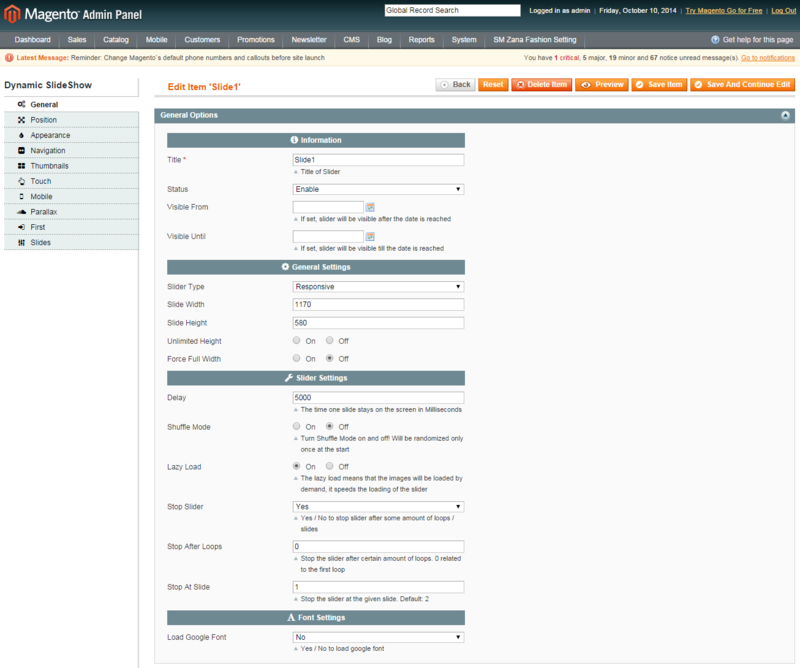 Add Menu Item button to create the Menu Items. 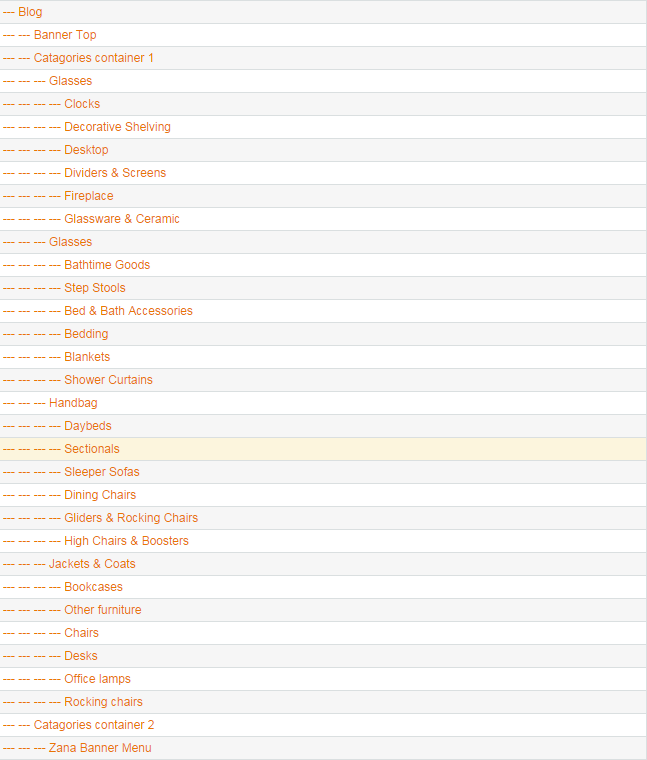 Note: Other menu items (“Glasses; Jackets&Coats, Handbag, Clothing”) do have the same settings with the items above. 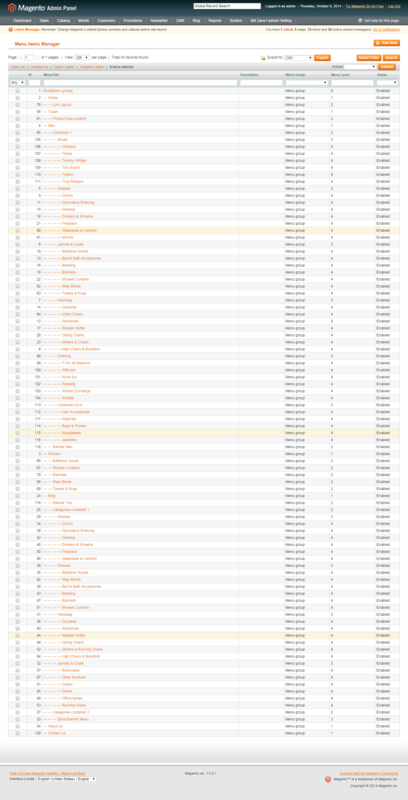 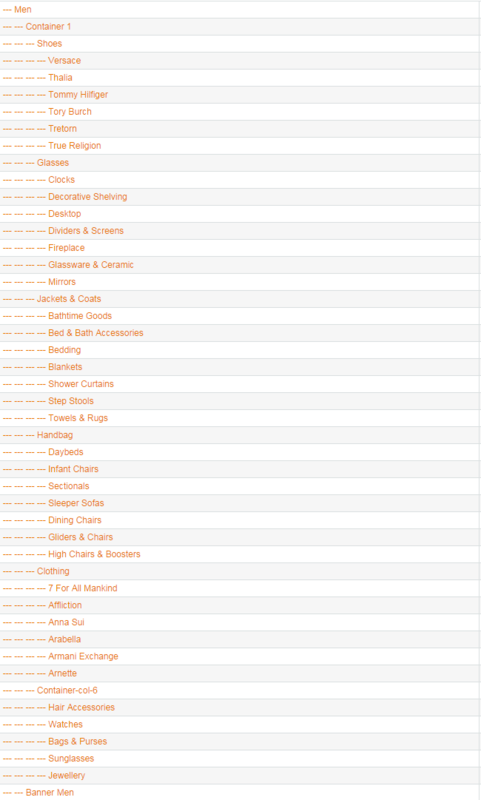 “Blog” Item has Menu Type: “Category”. 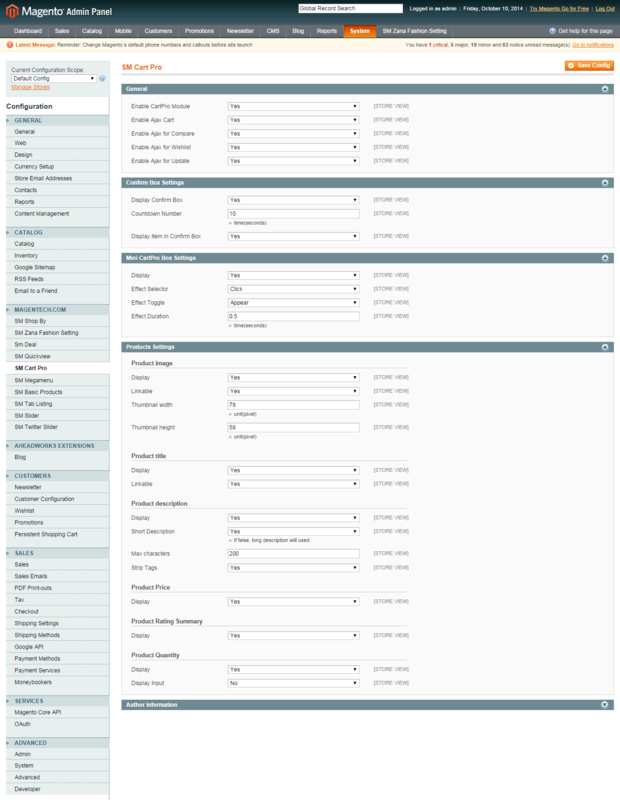 To Configure this please go to Catalog >> Manage Categories >> Add a Subcategory. 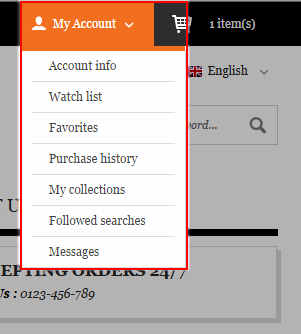 “Banner Top” Item has Menu Type “Content”. 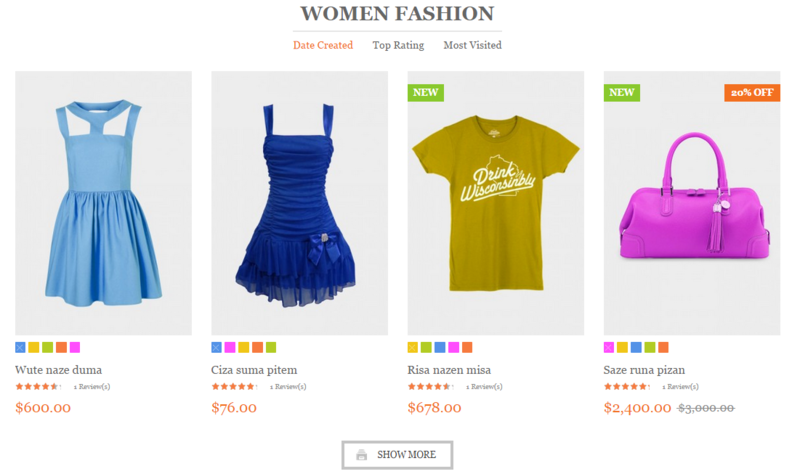 “About Us” Item has Menu Type: “Category”. To Configure this please go to Catalog >> Manage Categories >> Add a Subcategory. 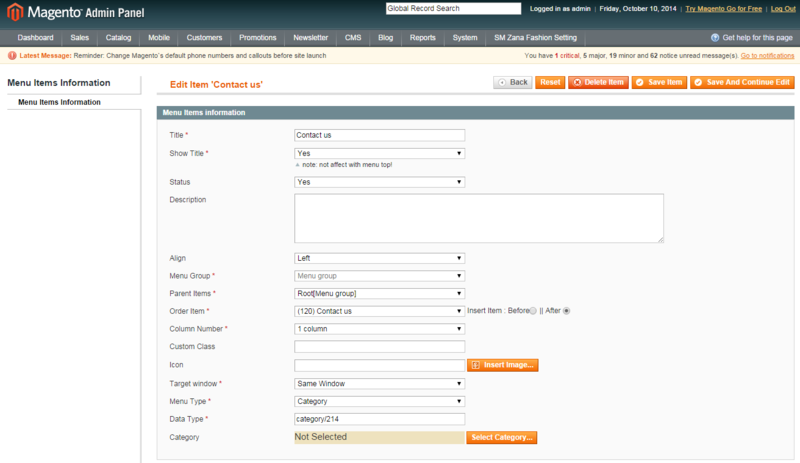 “Contact Us” Item has Menu Type: “Category”. To Configure this please go to Catalog >> Manage Categories >> Add a Subcategory. 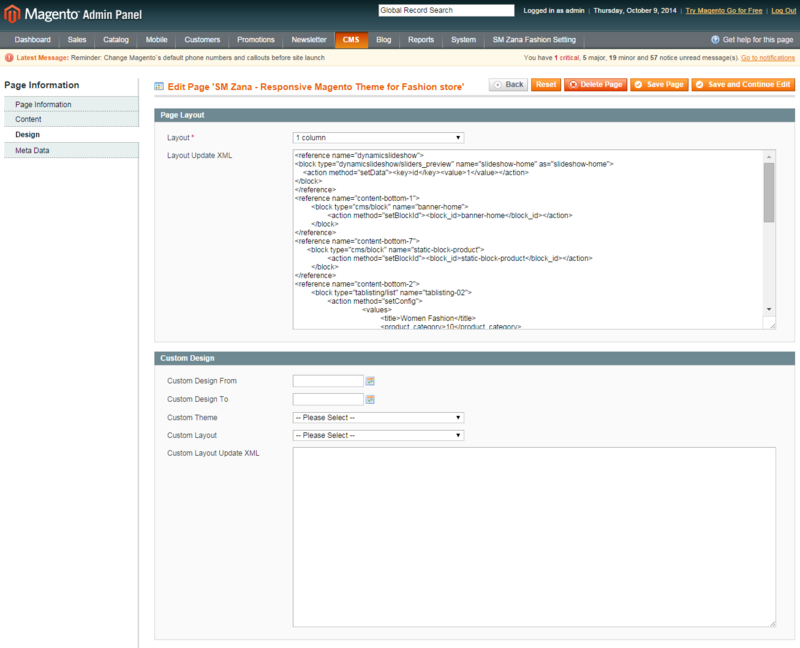 Link show Backend of Zana Top Info. 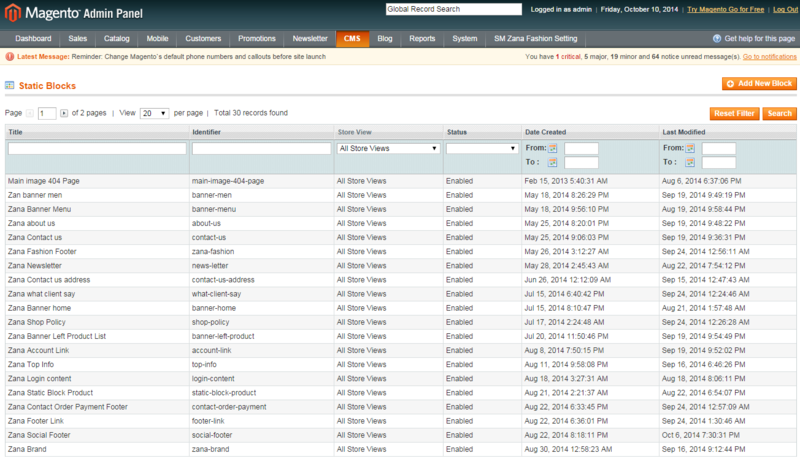 Link show Backend of Zana Account Link. 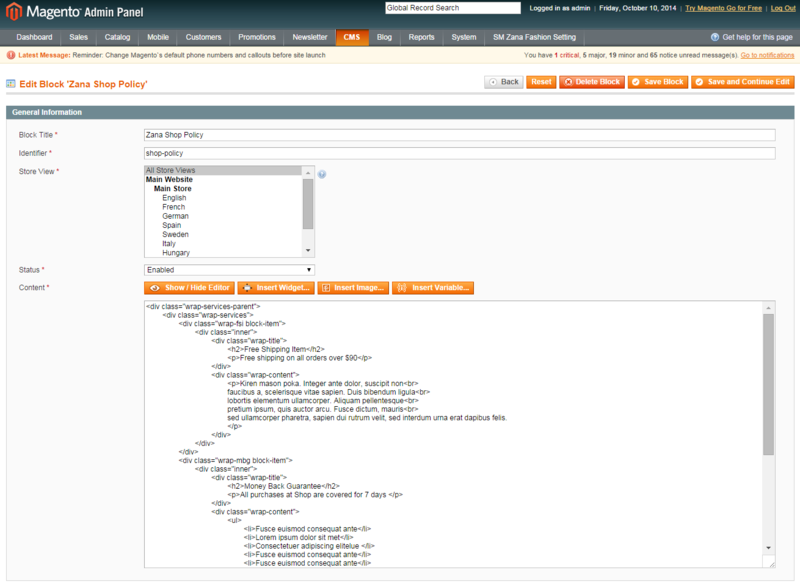 Link show Backend of Zana Shop Policy. 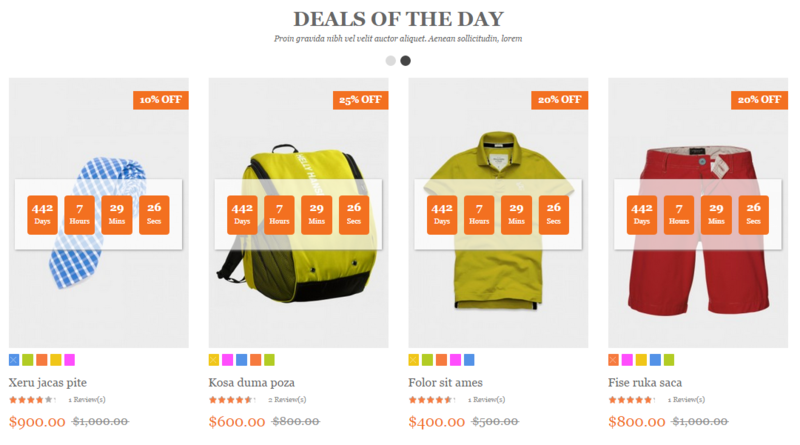 sed ullamcorper pharetra, sapien dui rutrum velit, sed interdum urna erat dapibus felis. Link show Backend of Zana Banner home. 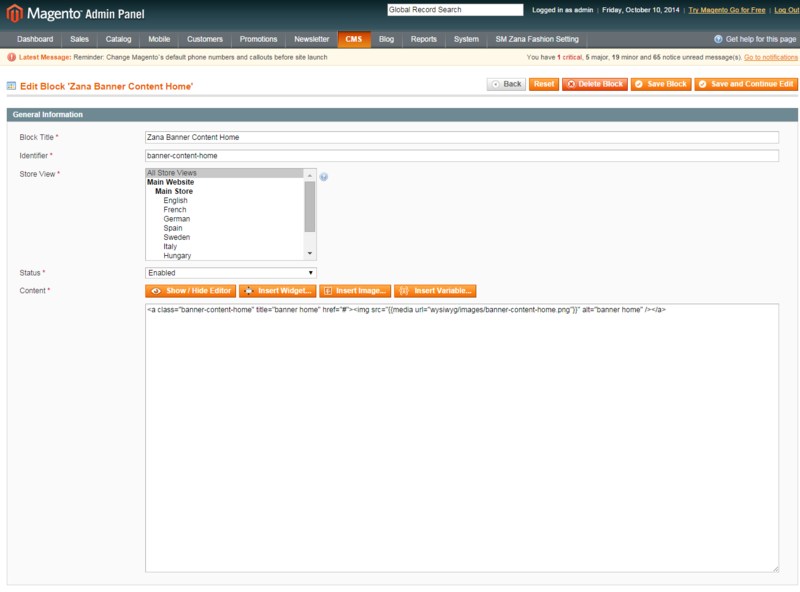 Link show Backend of Zana Banner Content Home. Link show Backend of Zana Static Block Product. 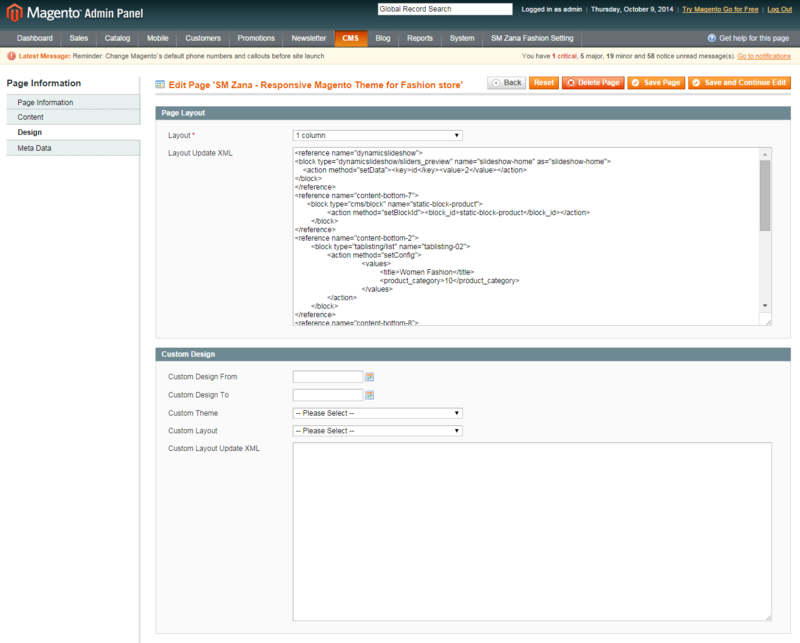 Link show Backend of Zana what client say. Link show Backend of Zana Brand. 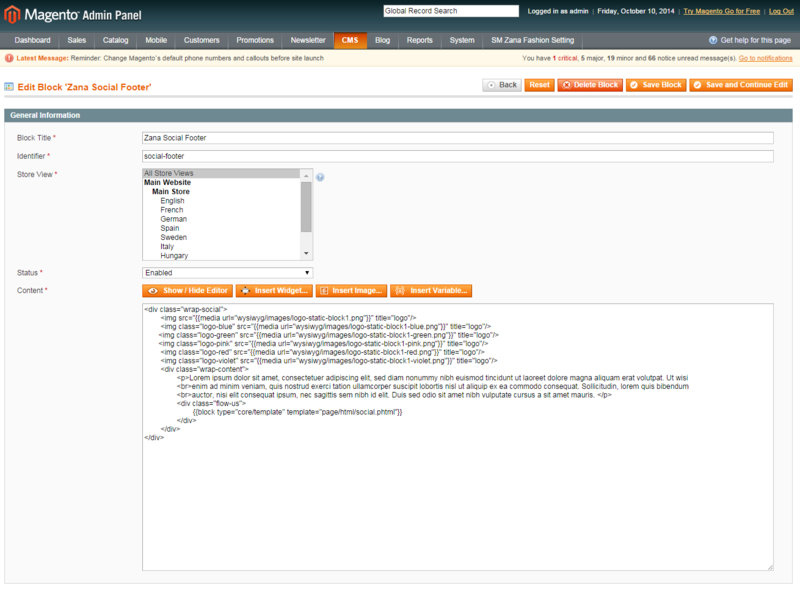 Link show Backend of Zana Social Footer. 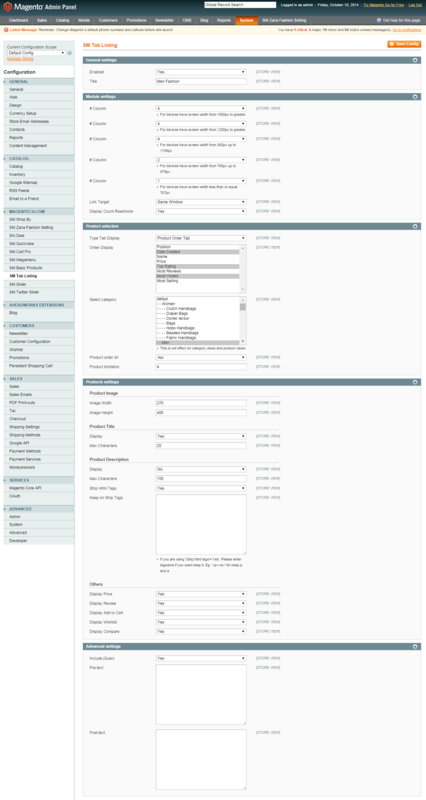 Link show Backend of Zana Newsletter. 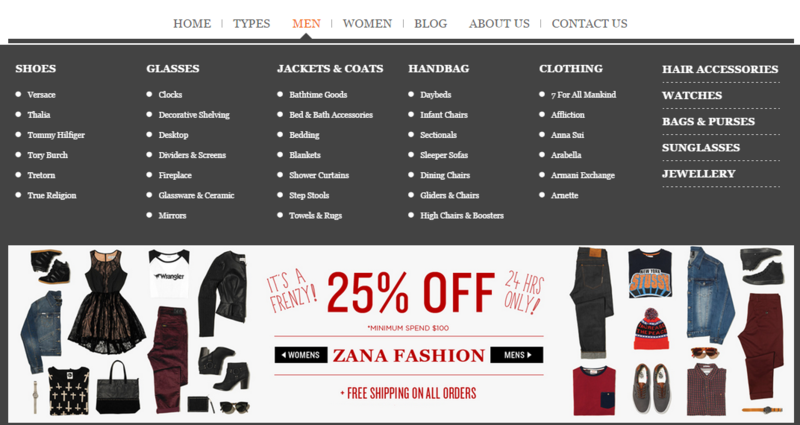 Link show Backend of Zana Fashion Footer. 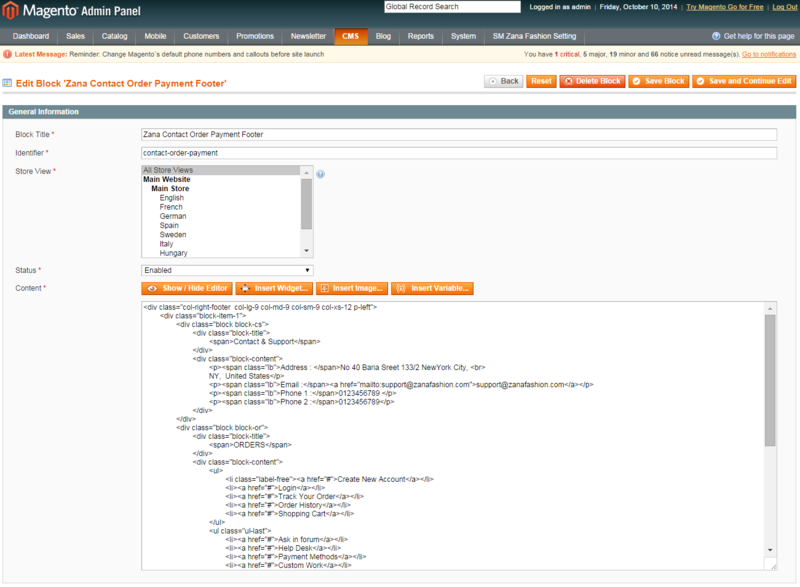 Link show Backend of Zana Contact Order Payment Footer. 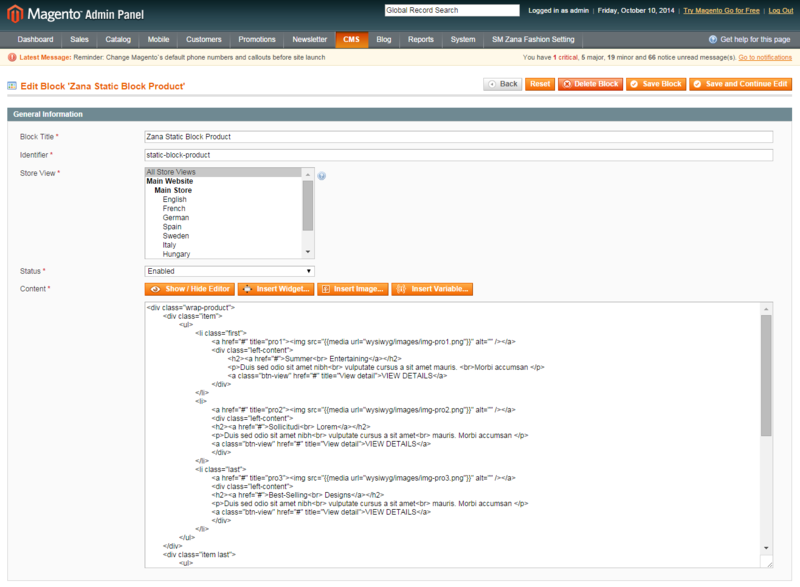 Link show Backend of Zana Footer Link.